Summary: When Kate, single mother and law firm partner, gets an urgent phone call summoning her to her daughter's exclusive private school, she's shocked. Amelia has been suspended for cheating, something that would be completely out of character for her over-achieving, well-behaved daughter. Kate rushes to Grace Hall, but what she finds when she finally arrives is beyond comprehension. Her daughter Amelia is dead. The moment she sees that message, Kate knows in her heart it's true. Clearly Amelia had secrets, and a life Kate knew nothing about. Wracked by guilt, Kate is determined to find out what those secrets were and who could have hated her daughter enough to kill. She searches through Amelia's e-mails, texts, and Facebook updates, piecing together the last troubled days of her daughter's life. I stayed up a little late last night listening to the end of RECONSTRUCTING AMELIA by Kimberly McCreight so I could feature it on today's Mystery Mondays post. I had another book read and ready to go, but I was so excited about RECONSTRUCTING AMELIA that I didn't want to wait another week before sharing. This audiobook was fantastic -- both because of the story and the performance! For those of you who have been living under a rock (just kidding! ), RECONSTRUCTING AMELIA explores the death of a teenage girl named Amelia. Amelia is a good kid and an even better student, so her mom Kate is shocked when she gets a call from the school to pick up her daughter. By the time Kate reaches the school, she learns that Amelia is dead from an apparent suicide. Supposedly, Kate was so upset because she was caught cheating that she jumped to her death. Kate finds it hard to believe that Amelia would kill herself, but school officials and the police assure her that's exactly what happened. Kate is left to grieve the loss of her only daughter and try to move forward with her life, but none of this makes any sense to her. Then, Kate receives an anonymous text telling her that Amelia didn't jump; and she begins her own search through her daughter's emails, texts, and Facebook posts to try to determine what was going on in her daughter's life. Wow! I thought RECONSTRUCTING AMELIA was a darn good mystery. It was extremely entertaining with lots of terrific twists, and as a mother, I even found it a little disturbing. (Teenage girls can be so cruel!) I won't go so far as to say that I had no idea what happened, but I will say that the author presented enough twists and turns at the end that I did change my mind more than a few times about what I thought took place. Overall, I thought it was a well constructed mystery and I enjoyed how the author told the story. RECONSTRUCTING AMELIA was presented in a variety of ways -- snippets of Amelia's texts and Facebook posts as well as chapters narrated by Kate and Amelia. In addition, the book had flashbacks which revealed more about Kate and Amelia's pasts. It was through these flashback sections that the reader ultimately learns about what happened to Amelia; however, I especially enjoyed them because they gave me more insight into the characters. While RECONSTRUCTING AMELIA was definitely an intriguing mystery, this novel also explored some pretty serious relationship issues. And it was probably this glimpse into teenage relationships that made the book extra special to me. I hesitate to say much more about this novel because I fear that I will give away too much about the mystery surrounding Amelia's death. Many of the issues that I want to feature in this review would be considered spoilers. Suffice it to say that I found this novel (and the issues it addressed) to be refreshing and one that I won't soon forget. RECONSTRUCTING AMELIA is a must-read! 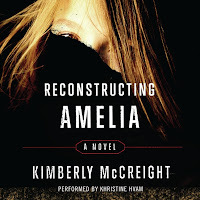 The audiobook of RECONSTRUCTING AMELIA was performed by Khristine Hvam , and I thought she did a wonderful job. Ms. Hvam did male voices, teenage boy voices in addition to a variety of female voices; and she even did managed an accent or two (if you count New York and Brooklyn ones!) I was especially impressed with her teenage girl voices -- they were just spot on. As I listened to this book, I remembered Ms. Hvam's voice from an earlier audiobook that I loved -- WHY WE BROKE UP which also featured a teen's voice. I know a lot of book clubs are reading GONE GIRL (the book that RECONSTRUCTING AMELIA is being compared to), but I've always kind of scratched my head. I just didn't really see it as an ideal selection. However, I do think RECONSTRUCTING AMELIA would be an interesting selection especially for groups like mine consisting primarily of mothers with teen and pre-teen daughters. 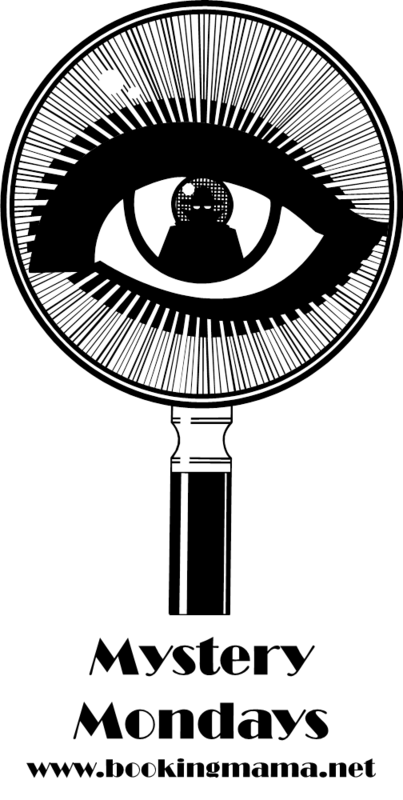 There is a reading guide with thirteen questions that is sure to generate some discussion. 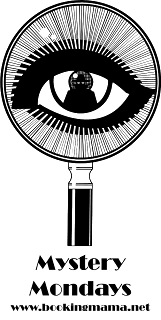 Some of the themes you might want to explore include communication, social media, technology, friendships, mother/daughter relationships, sexuality, secrets, bullying, secret societies, guilt, single parenting, grief, and forgiveness. I thought RECONSTRUCTING AMELIA was a great read especially on audio, and I highly recommend it to fans of mysteries as well as ones who enjoy novels about relationship issues. Wow, you listened to this one quickly! It must really be terrific! I think it will be the next book I put on my phone! I got this ARC at SIBA last fall, and the publishers were going nuts over it. Of course who knows when I will get to it, but I will at some point. I'm pretty sure though that it will make my stomach hurt because I know how hard it is for kids these days. I really loved the audio production on this one. I liked this book but didn't love it. And I think my problem was too much anticipation -- I set my expectations too high.